It's the Golden Age of Piracy! You and your crewmates are among the most ruthless and fearsome pirates on the high seas. Whenever you set sail, you're certain to return with a ship stuffed full of booty. Being backstabbing thieves, however, dividing the spoils is always challenging. You've all agreed to rules for allocating shares, but everyone hopes to manipulate the system and go home with more than the rest. Can you connive to claim the most valuable booty? 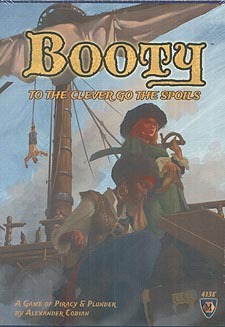 In Booty you try to amass the most victory points by collecting treasure, raiding ports, rigging the goods market, and scoring one of your legacy tiles. You need to be wily, make the most of available spoils, and sieze the cut that suits you most. Each turn one of your crew is Quartermaster and determines how the ever-changing spoils get divided. Good Quartermasters know that not all booty is created equal. And you best beware that you might soon lose the job!